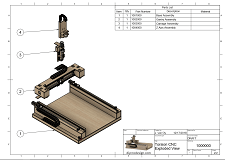 Purchase a set of plans for the Torsion CNC machine. Digital delivery in PDF format. Immediate download after payment. This machine is a high performance CNC machine using HIWIN profile linear guide rails and bearings, driven by C7 accuracy ball screws. The machine was carefully engineered to maximize performance and minimize cost to build, with low maintainance and high reliability. 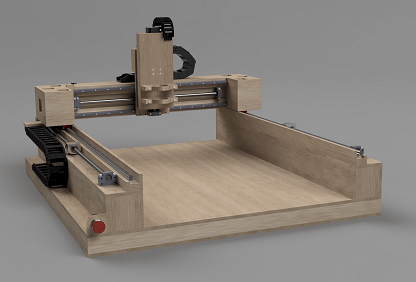 The frame components are constructed from hardwood baltic birch plywood using a torsion box design. 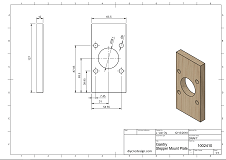 The torsion boxes create a very stiff structure that is very good at resisting twist and deflection during machining operations. You will get incredible performance for the cost. The estimated cost to build a running machine from these plans is approximately $2000 to $2500. As a comparison, to buy a commercially available machine of similar capability would cost anywhere from $6000 to $10000. Many advertised prices for other kits and machines do not include electronics, or other required components. Working area of approximately 37" x 25" x 6"